18/11/2017 - The latest update to be released on the Mega Italia Media cloud carries several changes. 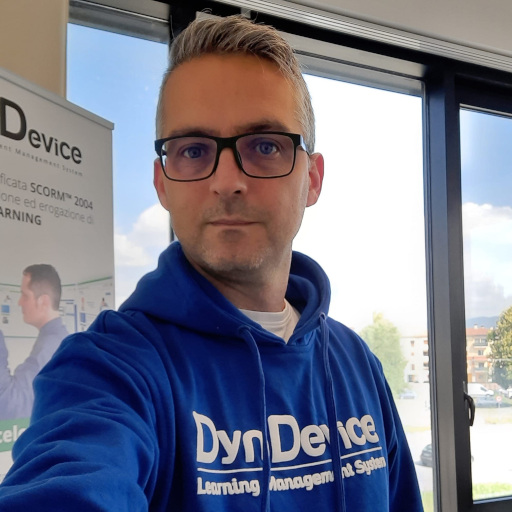 We have just completed the release on the whole Mega Italia Media cloud of version 2.1 build 002 of DynDevice (training management system), the complete system equipped with 6 different cloud solutions: e-Learning platform, SCORM™ editor (LCMS with authoring tools), HR management, web content management and company intranet management. The following release note lists and explains all the improvements introduced with this update. • A "Automatically disable user audio" option has been added to select whether participants' audio is to be deactivated by default upon joining a meeting. Training archive. The management of your training archive ("Other training" or "Previous training") is now equipped with a "Composite courses". More than one "Other training" courses can now contribute to the same "Corresponding course" (e-Learning or blended) both in terms of total hours attended and to determine expiration. This enables the merging of several "non-DynDevice" courses into a single course (which may be legally valid), with a single date for expiration of validity. Likewise, report data will be shown in an aggregate and easy-to-read way. "Courses" module. On each page generated by this module which displays the list of courses "by category" (both e-Learning and classroom-based) and a course's details, it is now possible to "overwrite" the <title> and the <description> meta-tags by indicating specific values to replace the auto-generated ones. "Magazine" module. This module is now fully multi-language and can be independently managed for each language, from issues and categories to article management. Therefore, it will not be mere translation into another language, but an actual independent magazine with specific issues and articles for each of the site's languages. "Search engine" module. It is now possible to search articles from the "Magazine" module based on each visitor's navigation language.